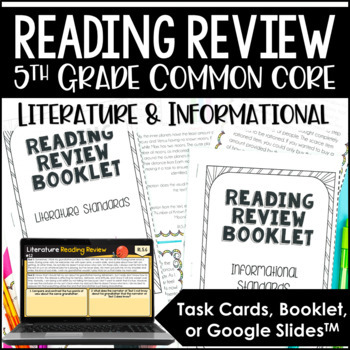 Need a reading test prep resource to review all of your reading standards in 5th grade? This reading test prep review is a rigorous and practical Common Core Reading Test Prep resource that reviews all of the 5th grade informational and literature standards. This 5th grade reading test prep bundle includes the Literature Set and the Informational Set that can also be purchased separately. Click here to see the 4th grade version. The 4th grade and 5th grade versions include 100% unique texts so you can actually use both resources for review, differentiation, or re-teaching. 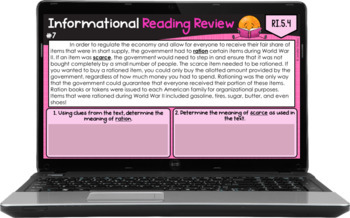 The Informational Reading Test Prep Set includes 18 reading review pages that cover the informational standards RI.5.1-RI.5.9. There are two pages per standard. Each page comes with a text (or multiple texts depending on the standard) and two questions. The Literature Reading Test Prep Set includes 16 reading review pages that cover the literature standards RL.5.1-RL.5.9. There are two pages per standard. 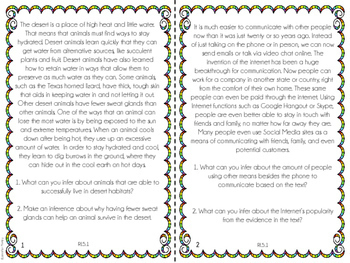 Each page comes with a text (or multiple texts depending on the standard) and two questions. 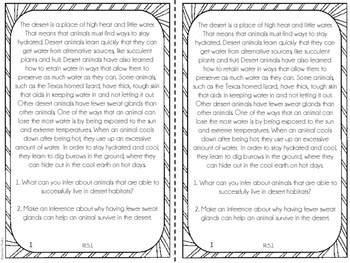 Each set is available in two formats: use as a mini-booklet or as task cards. Each card or page is labeled at the bottom with the standard that it addresses. There are two pages per standard. Each page contains a text (or multiple texts, depending on the standard) and 2 questions.